This morning I was sitting down to a peaceful worship. The birds were quietly singing while a gentle rain fell. All of a sudden I hear this loud squeaking outside our kitchen window. I hopped up to view a most disturbing... unwelcome site. A hawk ( I think a Broad-winged ) stood right below my bird feeder with my friend, a Red-bellied Woodpecker pinned to the ground. "Oh no!" is all that could escape my mouth as I stood there in shock. The hawk turned its head up an glared at me for a moment, then took off into the woods across that street with the woodpecker's scream fading into silence. I was so mad! I stood there frustrated not being able to do anything. 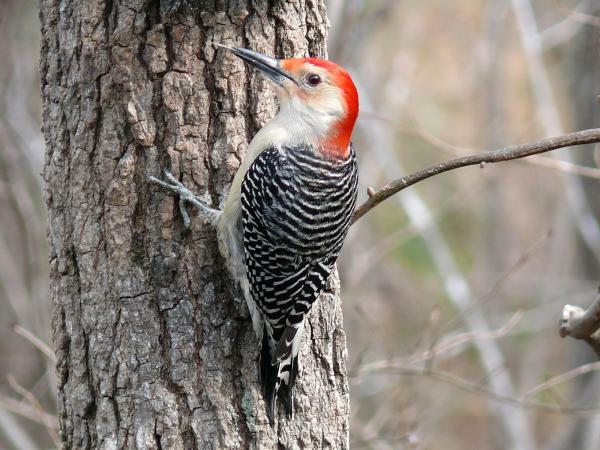 This woodpecker had become a regular to our bird feeder gradually growing more comfortable with our presence. Rather than protesting our presence he was beginning to fly in and cautiously feed while we were nearby. Just the other day Noah and I were out in our garden plot while he came into the nearby peach trees, then made the decision that we weren't so bad after all and flew in closer. As you can imagine we grew quite fond of this beautiful creature. I look forward to the day when this so called circle of life ceases to exist and TRUE balance is brought back to nature, humanity, and this place we call home... earth. I appreciate the free-will that our all-powerful God has given to us. I despise what rebellion to the life-giver has done to this planet. I am also thankful that God has promised that it won't be like this forever. The same God who intelligently designed the original world and set it into motion will destroy evil and restore this planet back to the original intended harmony. I look forward to this day. Even now God has given me encouragement and peace. As I was writing this, I got up for a stretch and looked out in our front yard. 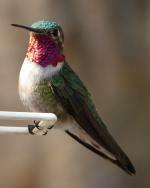 To my extreme delight our first Ruby-throated Hummingbird has arrived. He buzzed around the empty nectar feeder. It was soon filled. Nature is kind of like people. We can see the bad or we can look for the good. This morning I saw a great tragedy in my own front yard. I am sad by this, but I trust that death will be no more. Until restoration arrives I will strive to look for the rose amongst the thorns. That was sad! Unfortunately sin as encouraged the food chain the loss of flesh. As I was reading your story I ponder on the responsibilities of the hawk. What were it's needs,his survival and the survival of his offspring.In most cases animals hunt to survive. Your right, in the earth made new we will not have to go through such an experience as this again. I can only imagine your horror. We too see more "rare" birds who have decided to frequent our feeders and delight in their return as they become our friends. We know that they appreciate our offerings. Of course for now the hummingbirds have left, but WILL return come April-May or so. The seasons change and always bring with them another renewal.